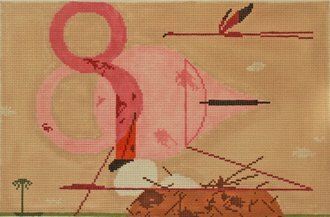 A Charley Harper needlepoint called Flamiingo featuring a cardinal amongst red and orange fall leaves. The design is hand painted onto 13 mesh mono needlepoint canvas and measures 14" x 9". If you wish to purchase stretcher bars we recommend one pair of 18" and one pair of 13".